Traditionally, the ‘second generation’ of English Romantic poets consists of Lord Byron, John Keats and Percy Bysshe Shelley. Shelley personally met both Keats and Byron, but the latter two never met and had little regard for one another’s work. Shelley and Keats met in late 1816 via their mutual friend, Leigh Hunt. Their occasional walks along Hampstead Heath resulted in Shelley advising Keats to not publish his early verse. The advice was well-meant but understandably bothered Keats. Later, when Shelley was a voluntary exile in Italy, the two poets exchanged letters. By this time, Keats’s genius had matured and Shelley was a devoted and enthusiastic admirer. Keats’s illness prompted an invitation from Shelley and his wife to stay with them in Italy; Keats declined, traveling instead with Joseph Severn as his companion. When Shelley drowned in 1822, a copy of Keats’s works was found in his pocket. You can read some of their correspondence at the Keats: Selected Letters section. The last letter Keats wrote to Shelley is particularly interesting. Keats himself was somewhat reserved in his admiration of Shelley. Having suffered his own share of bad luck and tragedy, he looked askance at Shelley’s infamous troubles, most of which were self-inflicted. Also, Leigh Hunt neglected his new friendship with Keats while he pursued financial and literary help from Shelley. 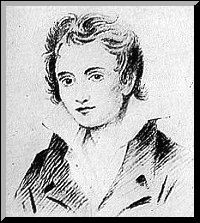 As for Shelley, his aristocratic upbringing did not blind him to Keats’s genius, as it did Lord Byron. His desire to help Keats, particularly during his fatal illness, was genuine. But there was a patronizing tone to Shelley’s advice – and John Keats did not need a patron. Shelley wrote the ‘Adonais’ elegy immediately after hearing about Keats’s death. It was composed during the spring of 1821 and first published in July 1821. In his preface to the work, Shelley specifically thanked Joseph Severn for his devoted care of Keats in Rome. This ensured Severn’s fame throughout literary Europe. ‘Adonais’ was composed as a pastoral elegy, specifically in the tradition of Milton’s beautiful ‘Lycidas’. Like most of Keats’s admirers, Shelley believed the poet died because of the harsh and negative reviews of his poetry, specifically those of the Quarterly Review. It was among England’s most influential literary papers. It was believed that Keats suffered a rupture in his lungs because he was so angered by the attacks. This was not true, of course, but the idea persisted well into the 19th century. Shelley’s use of the classical pastoral elegy form was natural enough. He had studied and translated many classical elegies himself; he had also read and admired Milton’s 17th century interpretation of the form in ‘Lycidas’. Most critics believe Shelley modeled ‘Adonais’ upon Virgil’s tenth Eclogue, Bion’s elegy on the classical hero Adonis, and the anonymous elegy on Bion himself. New splendor to the dead.